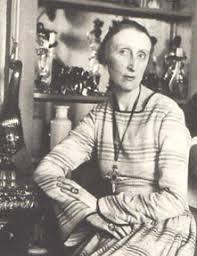 Among women in the 20th century, Edith Sitwell, English poet, towers above other writers. Born in England in 1887, Sitwell loved her visits to the United States, spent significant amounts of time writing in Paris and Italy, but lived most of her life among family and friends in England. Reared by a family who had ancestral ties to Plantagenet kings, Sitwell’s education took place under the guidance of governesses and in company of her two younger brothers, Osbert and Sacheverell, usually at the family estate, Renishaw. Even so, most of those circumstances worked against her as a writer. During the late 20th century, her prolific publications were dismissed by one influential American critic as belonging to the realm of society, rather than of letters. And because so many Sitwell admirers were, indeed, more fascinated with her personal life and circumstances rather than understanding her poetry, the critic’s judgment stuck and prominent feminist writers also ignored her work. Compelled to wear back braces during her formative years, enduring the humiliation of her mother’s jailing for debts at sixteen, suffering depression during the late 1920’s and the poverty of homelessness in her advanced years, Sitwell’s writing, especially her best poetry, became buried under the avalanche of personal events. But the energy and beauty of her writing endures, “With eyelids closed as soft as the breeze/That glows from gold flowers on the incense-trees” (from “En Famille”). One of the truly most “modern” of the “Modernists,” Sitwell, like her well-known counterparts, T.S. Eliot, Ezra Pound and Virginia Woolf, was innovative. During the early 20th century, when writers and painters were striving for radical new ways to express their discontent with “modern” values of materialism and industrialism, Sitwell wrote and produced with music, a group of poems titled Façade. Many of these poems are based on musical themes and strive for reader/listener attention through puzzling juxtaposition of images: “Like baskets of ripe fruit the bird-songs’ oaten flutes/All honeyed yellow wound in air . . . /Are tasting of fresh green anew.” In these lines from “Mazurka,” the theme of a lively dance is translated into “lively” images of sound, taste and color all intermixed together. Such language techniques were disturbing and disquieting for most listeners of her age, as they continue to be in the early 21st century. But it is her use of a conventional form such as poetry, with conventional words, arranged in shocking new ways that causes Sitwell to share an ethic with artists such as Kandinsky, Matisse and Picasso who were doing the same thing with paint. Her work also echoes the most famous musician of the age—Igor Stravinsky. His composition, Rite of Spring, jars the listener’s senses the same way most of the poems in Sitwell’s Façade, jar the reader’s senses. Beyond the importance of her early work of Façade, the compelling humanistic work of her Gold Coast Customs, her war poetry, “Still Falls the Rain” and her later lyrical work of Gardeners and Astronomers, Sitwell’s place in Modernist literature is unmatched. Her mentoring of other younger poets is what holds her apart from other women writers. Principally men—all of whom are better known than she, the poets include Stephen Spender, Dylan Thomas, Siegfried Sassoon and T.S. Eliot. Sitwell’s prolific correspondence with them and her encouragement to dozens of others (including a boxer), puts Sitwell’s influence far beyond her own compositions. Christian imagery and motifs are prolific in most of her poetry from 1929 to the end of her life in 1964, though she did not convert to Catholicism until 1954. But her taste, attitudes and gentility under girded much of the literary milieu in which she functioned. She was generous and kind in her literary relationships with other artists as well as her own brothers—especially considering she was not eligible to enter, much less use, libraries or access books, as young men could. For a woman who was unusually tall—nearly 6 feet and whose stark facial features provoked recognition of her noble heritage, Sitwell was a woman who modeled virtue, gentleness and strength. This article was submitted by Pamela Slate Liggett. She was born in Newport News, Virginia and currently resides in Tulsa, Oklahoma. She has three grown daughters—two teachers and one journalist. Pamela has been published in literary criticism journals and is working on 3 book projects in various stages of completion – all of which are about women.